Conquest Strate Up extended her unbeaten record to three races Saturday at Woodbine with a come-from-behind score under Alan Garcia in the $125,000 La Prevoyante Stakes. 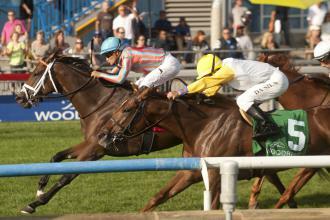 Conquest Strate Up wins the La Prevoyante Stakes by a head Saturday at Woodbine. After missing the break, Conquest Strate Up raced at the rear of the field on the backstretch as Hot Cross Buns set moderate fractions in the one-mile turf route. Internal Bourbon made her way to the lead from a stalking position in midstretch while Conquest Strate Up was in the midst of her rally, and the former got up in the final strides to prevail by a head in 1:35.58 over the firm ground. Conquest Strate Up ($12.30) earned $75,000 for Conquest Stable and trainer Mark Casse.